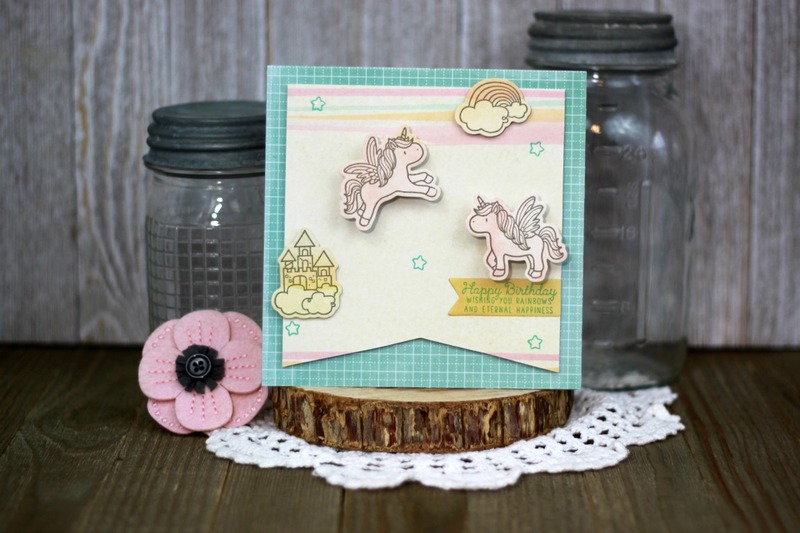 Do you know anyone in need of a unicorn adorned and rainbow filled birthday greeting? Of course you do, so let’s take a look at how easy this one is to create using the new Hampton Art/Mama Elephant “Over the Rainbow” stamp and die set. It began with a square shaped card base with a blue grid pattern paper added as a background, this one is from a Studio G paper pack. Next cut out the large banner piece from a rainbow stripes paper in that same pack. Add the banner piece to the front of the card base as shown with 3D foam dots. Then stamp the unicorns, castle and rainbow onto the colored clouds paper from the pack in dark gray ink. Then stamp the sentiment onto the yellow pattern paper from the pack in turquoise ink. After stamped use the dies to cut out the shapes with your die cutting machine, these were cut with a Cuttlebug. Then position the die cuts onto the card front as pictured adhere the castle and the rainbow with 3D foam dots. Adhere the banner sentiment with regular adhesive. To make the unicorns leap off the card use the Action Wobbles, our mini action springs. Last stamp the small stars in turquoise ink as shown. This card is turns out crazy cute and suitable for all ages, don’t you agree?